Keylogger ME is in a class of spy software known as a Keylogger. The spy, you, is able to spy on other computer users using this stealthy method of watching and recording everything they do while they are on the computer. When activated Keylogger ME doesn't sleep, it's always watching and reporting only to you. 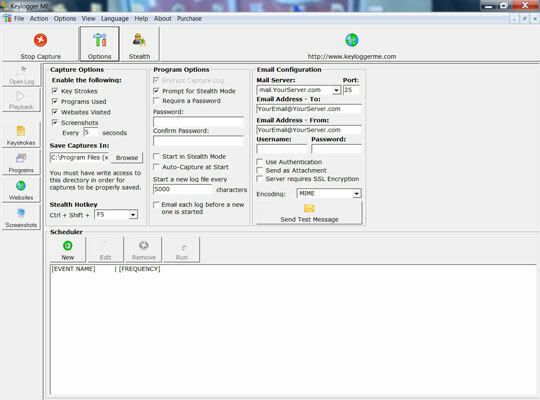 These screenshots show the various tracking features Keylogger ME offers. Playback - Runs a movie showing what websites were visited, what was typed on the keyboard, screenshots recorded as they happened in timed intervals. Keystrokes - Shows everything that was typed on the keyboard including date and time of all keystrokes logged. Programs - Report shows all programs that were run on the computer. Very detailed computer usage report generated. You know everything that was run on the computer. Websites - See exactly what sites and pages were viewed online. 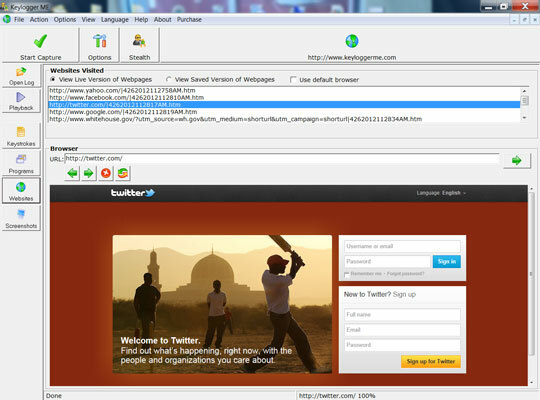 Imbedded browser allows you to go direct to those pages. Screenshots - As an added layer of spying screenshots are taken in timed intervals showing exactly what is on the computer screen. View screenshots using this feature.